American musician Luther Russell has been making music since the early nineties, first as a member of The Bootheels, then as part of the band The Freewheelers, before going on his own, releasing five full-length studio albums. The songs date back to Russell's earliest days with a couple of unreleased demo tracks from The Bootheels, which included future founding member of The Wallflowers, Jakob Dylan. In fact only four of the nineteen songs that appear on the first disc have ever been released, as most of the songs appear in raw, demo form as you can really appreciate Russell's songwriting. His sound can easily be compared to the music of Ryan Adams, Jeff Tweedy or Elliot Smith as Russell songs are well-crafted, even as they appear in their demo form. The second disc begins with the song "Smoke Signals," which also appears here in demo form, but with a full band that makes the song sound nearly complete. Russell's work with former Black Crowes bassist, Marc Ford helped give the songs of Luther Russell an alternative-country sound, similar to Wilco and Big Star. Throughout his solo career, Russell would experiment more with styles, as displayed in the instrumentals "Fried Bananas" and "Keohen's Theme." Many of the songs on this second disc feature Russell on his own, such as performing the piano ballad "Empty Taxis" or the acoustic folk strumming of "Somehow Or Another." The 22-track second disc wraps up a few tracks he's composed in the last five years, including the lush instrumental "The Sunnyland" and the steady acoustic rock appeal of "The Sound Of Rock & Roll." 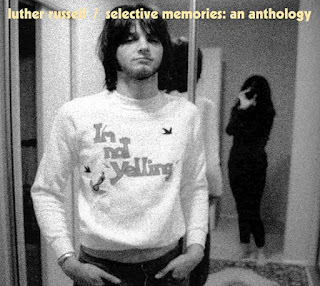 Also included in this 2-CD anthology is a 24-page booklet with descriptions of every song that appears in this set. To find out more about the newly released "Luther Russell / Selective Memories: An Anthology," please visit hankypankyrecords.bigcartel.com.